Burnley secured their third consecutive win across all competitions after fighting back from one goal down to register three points against Claudio Ranieri's spirited Fulham, even though the Clarets didn't register a single shot on target throughout the match. The visitors took less than two minutes to break the deadlock and it came thanks to a moment of brilliance from André Schürrle, but own goals from Joe Bryan and Denis Odoi turned the game on its head inside the opening 25 minutes of the game. Schürrle opened the scoring in some style, controlling a high ball inside the penalty area before firing an unstoppable half-volley off the underside of the crossbar and into the far corner of Tom Heaton's goal. Going behind kicked Burnley into gear and they peppered the area around Fulham's goal throughout the rest of the first half and they came back on level terms when Jeff Hendrick's cross-come-shot was turned by Joe Bryan into his own net. The turnaround was then completed thanks to another own goal just moments later. This time, Hendrick's cross ricocheted off Denis Odoi and left goalkeeper Sergio Rico helpless as the ball nestled into the corner of the goal. Calum Chambers rattled the crossbar in Fulham's search for an equaliser, but that was the closest Ranieri's side came for the rest of the match and the high-tempo game slowly petered out until the final whistle. Three points is three points at the end of the day, but Sean Dyche's side didn't register a single shot on target during their 2-1 win over Fulham. While Chris Wood was a handful for defenders and Ashley Barnes came close (ish) with a long-range effort, the only action that goalkeeper Sergio Rico saw was dejectedly picking the ball out of his own net. Heaton (6); Bardsley (7), Tarkowski (8), Mee (6), Taylor (6); Hendrick (8*), Cork (7), Westwood (6), McNeil (7); Wood (7), Barnes (6). Not many would have predicted that Jeff Hendrick would be walking away from Turf Moor with two assists to his name, which is made all the more bizarre as no Burnley player even got themselves on the scoresheet. The Republic of Ireland international acted as Burnley's engine room and was even getting past the mobile Jean Michaël Seri with ease, but it was in the final third where Hendrick impressed the most. 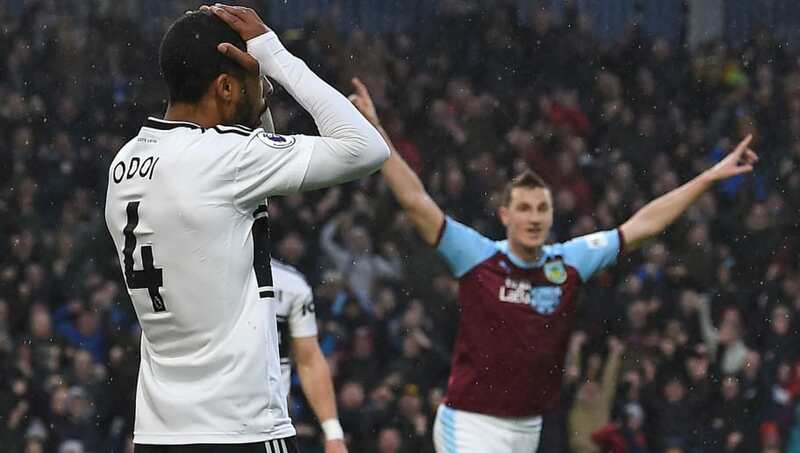 It was his cross-come-shot that led to Burnley's equalising goal, while his dangerous cross was diverted into his own net by Odoi for what proved to be the final goal of the game. All of Burnley's players can hold their heads high following their performance against Fulham, but defender Charlie Taylor had a longer afternoon than most. The former England Under-19 international was up against Fulham's in-form André Schürrle. The German has been very hot and cold this season, but he had the better of Taylor throughout the match and kept the 25-year-old on the backfoot during his time on the pitch. If you've watched Fulham at all this season, you'll know all too well that Claudio Ranieri has a right old job on his hands if he's going to sure up the Cottagers' defence. Although not much could be done about their two own goals, Fulham allowed the hosts to effortlessly get into their final third and for a 20 minute period in the first half, the ball was constantly bobbling around the visitors' penalty area. On the bright side, might be the first time we've scored 3 in a half all season. Only Fulham could score 3 goals and be 2-1 down. ​​Ranieri knows all too well the importance of a solid defence when it comes to climbing up the table, but Fulham's current crop of defensive players are barely even performing at a Championship level this season, let alone meeting the Premier League's standard. Rico (6); Odoi (5), Ream (6), Le Marchand (6), Christie (6); Chambers (7), Seri (5), Bryan (4); Schürrle (7*), Mitrović (6), Sessegnon (7). Substitutes: Vietto (7) Cairney (6) Kebano (N/A). Fulham might be making the long journey back to the capital empty handed, but André Schürrle's performance will give fans some hope that their squad's firepower could be enough to keep them up this season. Not only did the former Chelsea and Borussia Dortmund star score one of the goals of the season within the opening two minutes, but he was a constant thorn in the side of full-back Charlie Taylor. On Fulham's left side, Joe Bryan put in a performance which can only be described as a liability in defence, coupled with uninspiring in the attack. Fulham's full-back was exposed all too often before he was eventually hooked in the second half, while he failed to string two passes together before giving the ball away and putting the visitors under pressure once again. Burnley will look to make it three Premier League wins from as many games when they travel to Watford next week, before taking on Manchester City and Manchester United away from home in the FA Cup and league respectively. Fulham, meanwhile, welcome Tottenham and Brighton to west London, but unlike Burnley, will get a full week to rest in between the games after getting knocked out of the FA Cup against Oldham last week.